“It’s huge and it’s heavy,” exclaimed Sue Brannan Walker as she received the Frank Fleming bronze, symbolic of the Eugene Current-Garcia Award for Alabama’s Literary Scholar of the Year. Walker received the honor during the annual Awards Luncheon at the The Alabama Writers Symposium on April 28 in Monroeville. “This place is very, very special to me,” said Walker. “Before graduate school, I taught eighth grade English. To Kill a Mockingbird was the first novel I assigned.” The Fleming sculpture is a replica of the old Monroe County Courthouse, a setting for Harper Lee’s book. 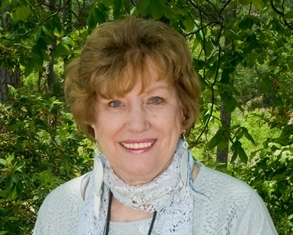 Walker is the immediate past president of the The Alabama Writers’ Forum board of directors. She also served on the Forum’s founding executive committee from 1992-1995. Gov. Bob Riley commissioned Walker as Alabama Poet Laureate in 2004, and she served two terms. Walker holds a B.S. from the University of Alabama and an M.A., M.Ed., and Ph.D. from Tulane University. “The Alabama Writers’ Forum congratulates Dr. Sue Brannan Walker on being recognized with the 2013 Eugene Current-Garcia Award,” said Forum Executive Director Jeanie Thompson. “Sue has distinguished herself as a writer and a scholar for the length of her career, having served as the state’s poet laureate while completing scholarly work and her own poetry. With the publication of her major book on James Dickey’s poetics soon to be available, this award is particularly timely. Walker is known nationally and internationally for her poetry and critical articles on poets and writers such as Dickey, Marge Piercy, Flannery O'Connor, and Carson McCullers. As publisher of Negative Capability Press and of the journal Negative Capability, she has published such notable authors as Jimmy Carter, E.O. Wilson, John Updike, William Stafford, Gerald Stern, Jack Coulehan, David Ignatow, Mary Oliver, Pat Schneider, Karl Shapiro, Richard Eberhart, Diane Wakoski, Roald Hoffman, Bernie Seigel, and Rita Dove and numerous Alabama poets and writers, providing them a greater audience and some of them their first opportunity to publish. Walker’s poetry, prose, and community service have garnered numerous awards, grants, and fellowships. The author of six volumes of poetry, Walker serves as the chair of the University of South Alabama English Department and director of the Stokes Center for Creative Writing at USA. Given each year at the Alabama Writers Symposium, hosted by Alabama Southern Community College and the Alabama Center for Literary Arts, the award reflects the respect of the scholar’s peers in the academic community. Annual selection of the recipient of the award is the task of the Association of College English Teachers of Alabama (ACETA), a diverse organization representing faculty at all of Alabama's two-year, four-year, and doctoral institutions. The award is sponsored by George F. Landegger, Chairman, Parsons and Whittemore. This annual award recognizes and rewards Alabamians who have distinguished themselves as men or women of letters, specifically in scholarly reflection and writing on literary topics. The honor includes a commemorative Clock Tower Bronze by Frank Fleming and a monetary award. The award is named for the late Dr. Eugene Current-Garcia, who, in a distinguished academic career spanning five decades, mostly at Auburn University, published six books and dozens of articles and reviews on the short story genre and Old Southwest humor and also founded and co-edited the Southern Humanities Review. Previous winners of the Eugene Current-Garcia Award include Claudia Durst Johnson (1998), Philip Beidler (1999), Don Noble (2000), Bert Hitchcock (2001), Trudier Harris (2002), William Hutchings (2003), Benjamin B. Williams (2004), Robert W. Halli, Jr. (2005), Nancy Grisham Anderson (2006), Elaine Hughes (2007), Norman McMillan (2008), John H. Hafner (2009), Ralph Voss (2010), David Sauer (2011), William Ulmer (2012).